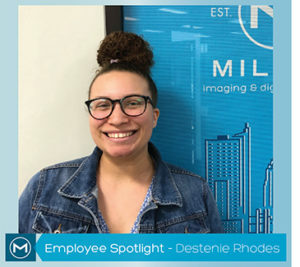 Destenie is a Graphics Customer Sales Service Rep. She is our expert candle maker and loves soul food. What do you do for Miller? I help cool clients that come to us with their graphics projects. If they aren’t sure what it is they want, but have a general goal, I help brainstorm ideas to make their needs come to life! Where are you from? I’m from Bryan/College Station! Home of the Aggies, although I never was into the whole rivalry between Aggies and the Longhorns. What is your favorite activity around Austin? SLEEPING! Being in college just does that to you. To really answer the question, I’d say going to the lake because I usually always go with my sisters. What is your favorite Austin Original? Roland’s Soul Food in East Austin!! It takes me back home to my Grandma’s cookin’! What was the last TV show you binged? Bob’s Burgers! What is a favorite Austin “thing” you’d recommend to do? I don’t know if I have an Austin thing. I always just kind of go out and see what pops up. There is always something going down here and if you just drive around aimlessly, you will find something. What do you spend time doing that is odd, quirky, unusual, or just enjoyable? I have a whole bunch of ethically sourced herbs and flowers that I make soy candles and perfumes out of! My house always smells like a botanic garden. What makes YOU be YOU? So I’m pretty bubbly and quirky, but a lot of it has to do with writing a list of everything I’m grateful for because I feel sometimes people stress themselves with things they don’t have or haven’t achieved, so recognizing and appreciating what you have can really improve your mood and attitude. Anything you are super pumped up about right now? Pumped is the constant mood for me. 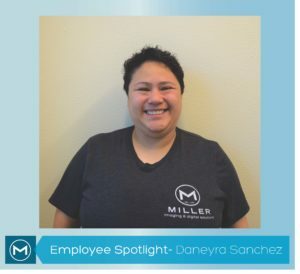 Daneyra has been a CIM Production Technician at our 7th Street Store since 2015. 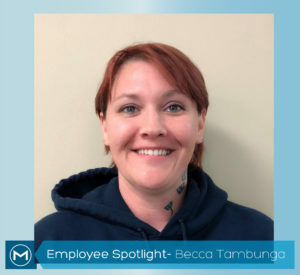 She is our resident foodie and lover of all things Mario. What do you do for Miller? :Everything Repro! I help customers with scanning and printing– making sure all plans are in the correct order and size! Where are you from? : Californ-I-A. I was born in LA.I moved to Texas in 1997 after I lived in South Carolina and Georgia. What was the last TV show your binged? : Dexter. It’s an interesting show—I like it because Dexter is a very superhero-like guy. Do you have any secret talents? : Cooking! My specialty is Machaca Tacos—shredded beef with tomatoes and onions topped with chipotle mayo. What is a favorite Austin “thing” you’d recommend to do in Austin? : Eat and try all of the flavors of Austin! Great food is everywhere! I just look on google for new places—especially new Asian fusion restaurants. Where is the best food in Austin? Loro and Old Thousand for Asian fusion. Toss Pizzeria ­for pizza and wings. Hopdoddy for burgers. If you could travel anywhere in the world, where would it be? India! For the culture, food, and the music. I love Hindi Pop! Can you tell me a little about your experience in the printing services industry? I’ve been in printing since 1997, mainly printing litigation documents and information. 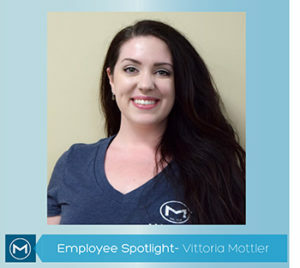 I joined Miller in 2015 and I enjoy going to work everyday and being part of the Miller Team! 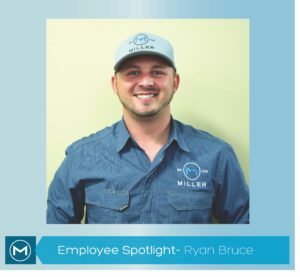 Ryan has been our Graphics Account Manager for 2 years. We love Ryan’s enthusiasm and dedication to getting the job done! What do you do for Miller? : I manage accounts and special projects/events. I work closely with some of our large clients to ensure that they are happy and getting the best products Miller has to offer. Where are you from? : I was born in California in 1986. When I was 9 we moved to Boise, ID where I grew up and spent most of my childhood. What is your favorite activity around Austin? : Fly Fishing the Guadalupe River in New Braunfels is hands down my favorite way to spend some time outdoors. Other than that dinners and drinks is my ticket to a good evening. What was the last TV show your binged? : Currently, it is Madame Secretary on Netflix. I enjoy all the action and drama in the show. Do you have any secret talents? : Being from the north, I am an avid snowboarder. Also I’d consider myself a fairly good handyman. What is a favorite Austin “thing” you’d recommend to do? : Watch the bats leave the Congress Bridge at sunset, from a canoe is pretty much amazing. I had one of the best nights here in Austin starting off with that. Also exploring the caverns in Round Rock was beautiful as well. I’d recommend doing both if you haven’t. Where are you from? : If from Austin area, name a K-12 school you attended that you’re proud of? : Austin! I went to McCallum High School in Central Austin. 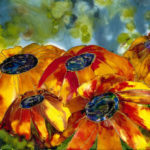 I also studied Graphic and Commercial Arts at Austin Community College and Texas State Technical College. What is your favorite activity around Austin? : I like fishing, hiking, and/or relaxing at a swimming hole, my favorite around here is Barton Springs. What or who is your favorite Austin Original? : Antone’s Night Club. They provide the authentic Austin weekend. It’s a place where you get to recharge and get some good local vibes. What was the last TV show your binged? : Marvel’s Daredevil. I like action and old school comics—Daredevil and Wolverine, those guys are tough and move fast. They never back down from any challenges. I like that. But you can’t mention Larry without mentioning his band, Afrofreque! 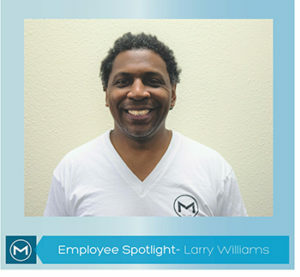 We love Larry, and we love Afrofreque. Check out their Facebook page here. What is a favorite Austin “thing” you’d recommend to do? : If you’re in Austin, you have to go to a great show at ACL Live at the Moody Theatre and then eat at a local Austin joint. I like Tamale House East and Styles Switch BBQ. Some places in Austin can be too much, but these places are just right. What do you do at Miller IDS? I process orders for customers, place supply orders and make sure drivers deliver orders to customers on time. Where are you from? if from Austin area, name a K-12 school you attended that you’re proud of. I am from Texas City, Texas, outside of Galveston. What is your favorite activity around Austin? Hanging out at family members’ houses or meeting with friends and family for drinks and some good laughs and stories. Who is your favorite Austin Original? Leslie Cochran, ’cause it’s Keep Austin Weird and you never knew what you’d see him dressed in! What was the last TV show your binged? : ‘Ballers’ because I love NFL football! Go Dolphins!!! Do you have any secret talent? Baking cake using Big Red soda as the secret ingredient. I assist in running the graphics department for Miller at the Metric Location. I help lead a great team at Metric in achieving high-quality, large-format products. I moved here from Maryland my senior year of high school. I went to Anderson High School. 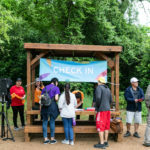 What is your favorite activity around Austin? I love the hiking spots around town. I take my dog Kaizer out on the weekends to hike. Some of our favorite trails are Walnut Creek and Emma Long Park. What or who is your favorite Austin Original? Hut’s is one of my favorite Austin originals. I love their bacon cheese burger! I make great chocolate milk—the secret is Hershey’s Limited Ingredients Chocolate Sauce! What is a favorite Austin “thing” you’d recommend to do in Austin? Go watch the bats! That never gets old for me. Scanning and Digitalization of documents. Customer Service, Reprographic Technician, Planroom back-up. Who or what is your favorite Austin Original? What is your favorite activity around Austin?I love the Rock Shop and I love antiquing…visiting museums, window shopping, looking around stores (I love little holes-in-the-wall). Amethyst is my favorite stone! I love me the Crystal Shop on Lamar. What is a favorite Austin “thing” you’d recommend to do in Austin? Summer Theatre in the Park (at Zilker Hillside Theatre). This Round Rock native spends most of his free time hanging out with his wife Megan, their dogs, and streaming video games online. Good food and the arcade scene. 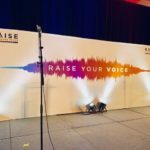 What haven’t you done in Austin that you’d like to do? I’d like to attend Dream Hack, SXSW, and try a new restaurant with Megan each week. If a movie was made about your life, who would you want to star in it? I would’ve said Denzel Washington previously, but right now I’d have to go with Donald Glover. Lastly, what’s your favorite thing about working at Miller IDS? 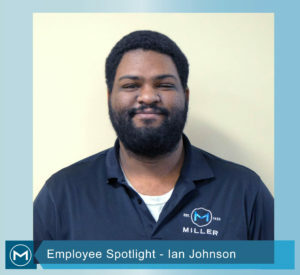 Ian (and his teammates) can be seen around Central Texas providing great customer service by maintaining and installing HP printers for our customers, as well as for our in-house fleet. We are thrilled that Ian calls Miller home!